Early last year, I stumbled on a fascinating post about probably one of the largest (if not, the largest) personal checks ever written. In late 2014, an Oklahoma County judge ordered oil billionaire, Harold Hamm, to pay his ex-wife $995.5 million. 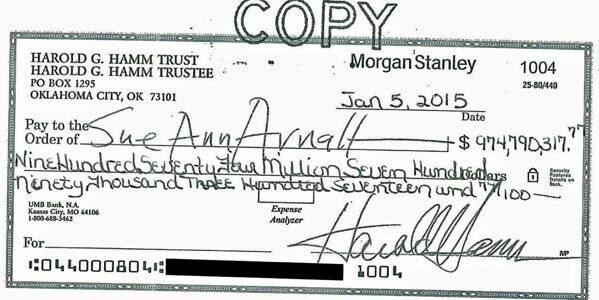 A couple months later, Hamm wrote out a check in the amount of $974,790,317.77 to his ex-wife, Sue Arnall – an economist and lawyer. Arnall initially appealed the judgement because she felt that it was too small of an amount given Hamm’s net worth of (at the time) $18 billion. But, the dissatisfied ex-spouse decided to drop the appeal and ended up cashing the check a few days after. I can only guess that she saw the writing on the wall with the falling price of oil – along with, Hamm’s net worth. During the last financial crisis of 2008-2009, Morgan Stanley was up a creek and needed some big-pocket investors to help stay afloat. In a crunch, they found the help they needed via Japan’s Mitsubishi Financial Group. Because the transfer needed to take place immediately and it was Columbus Day (a bank holiday), Mitsubishi cut a physical check to Morgan Stanley in the amount of $9 billion. 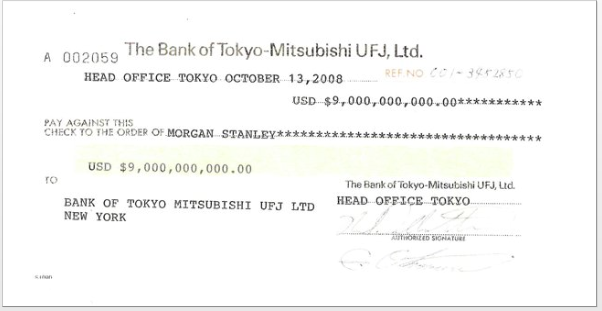 Today, Mitsubishi owns about 22% of Morgan Stanley as part of the deal (incidentally, the bank holds U.S. assets amounting to $2.3 trillion as of 2013). 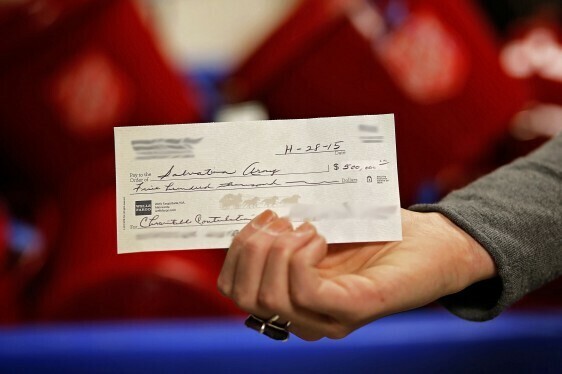 Just this past winter – during the Minnesota Salvation Army’s annual Christmas campaign (where many donations are accepted via their trademark red kettle bins), an anonymous donor slipped in a check worth $500,000. To put it into perspective, the largest single donation to that point (ever) during the campaign was $25,000. Even though this probably isn’t the largest donation given to a charity by check – it is still noteworthy with the size of it and the givers’ desire to remain anonymous. Given the personal and private nature of checks, they’re often never made “public” and it’s hard to pinpoint what are some of the largest check amounts in history. But it’s been fun to take a look at some of the largest that have made it into the spotlight. Are there other large checks that you’ve heard about that we missed? What’s the largest check you’ve written? This post has been brought to you by our friends at Northpointe Bank. All thoughts and opinions expressed are our own. What to Do With a Gold Inheritance? Interesting stories – perfect for a good weekend read.